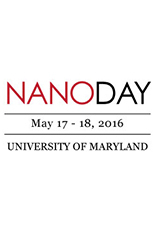 NanoDay 2016 was an intellectual treat, said attendees of the bi-yearly scientific mini-meeting, held this year on May 17 and 18. The conference kicked off on May 17 with Electron Microscopy Workshops, with in-depth presentations by experienced microscopists on recent advances in electron and ion microscopy. On May 18, Professors Steve Rolston and Mohammad Hafezi, both of the University of Maryland's Department of Physics and the Joint Quantum Institute, a partnership between the university and the National Institute of Standards and Technology, spoke on quantum nanoengineering. The second plenary, on energy storage, was headlined by Professors Esther Takeuchi of Stony Brook University and Marina Leite of the University of Maryland. In the afternoon, Alexander Liddle of NIST spoke to the audience about the latest challenges in nanomanufacturing. One highlight of the second day was a poster session, with unusual but career-building award categories. As an innovative way to introduce some real-world skills to young scientists, the posters are judged for newsworthiness, likelihood of startup funding and suitability for government funding. "These represent important areas in a scientist's life, ones that are subtle and are usually ignored in formal training," said Martha Heil, the NanoCenter's science communicator, who came up with the idea. Each first place winner recieved a fifty-dollar gift card; all winners recieved a certificate.